A video review is at the bottom of the page for a visual walk through. This unit was sent to me to review with my honest opinion and results below. 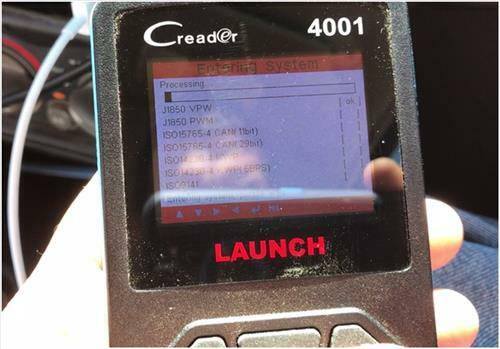 The CReader 4001 OBD2 scan tool doesn’t have much for appearance, but were it lacks in Looks, it sure makes up in features. I am use to a great packaging, and appearance of items I purchase. But the operation of such electronics is far from what I expect. However with the CReader 4001 it’s the opposite. Its appearance and screen reminds me of something from a decade ago. My concern was the operation of this code reader was going to be much like its appearance. That could not be so far from the truth. This is coming from someone who has been turning a wrench for a lot of years and has used multiple code readers. This thing is great. So in this review I will be going over some of its features that I personally enjoy about it, As well as, how to use it for beginners. Let’s start off by removing it from its package. I notice in the package there is an USB cord this cord is used to update your c reader 4001. This is a great feature because information changes from year to year, or as any mechanic will tell you, daily. In 6 months time a new make and model can pop out, and you are ready for it. On the bottom side of the 4001 you will see the plug for the USB chord. Just plug it in and visit the website. 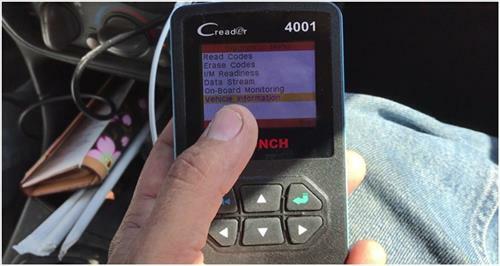 The CReader not only performs the task of an OBDII reader, but the EOBD as well. This is huge for mechanics that need this information. 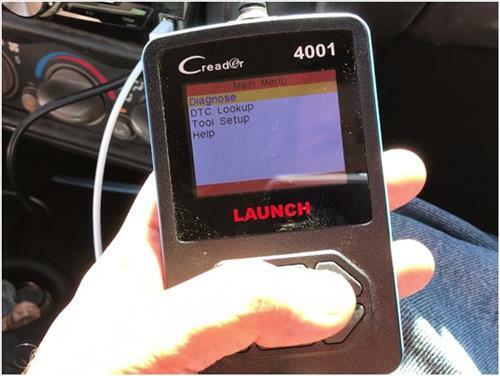 The one thing that I notice is that it does not cover ABS, and while this is important to a lot of mechanics when buying this tool, to the average person wanting to clear the check engine light it does not. For the value pound for pound, personally I am very impressed. Why would you buy this tool? There are a few reasons. 1… Because you have a check engine light and want it cleared. 2… You are planning to go to a mechanic and want to make sure you are getting your money’s worth and they are not selling you something you don’t need. 3… You feel the problem has to be simple and you know you can do it on your own. 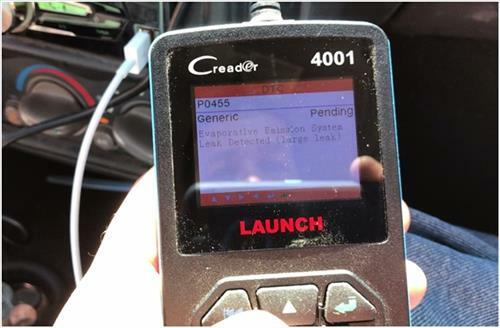 For any of these reasons, the CReader 4001 would make a great choice. Do not get discouraged if your code reader does not power up when you open the package. 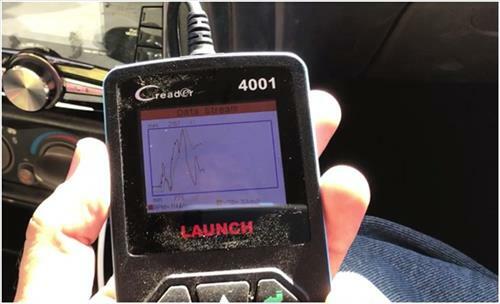 The code reader does not take batteries, it powers up on the voltage from your vehicle. The 4001 will operate from 9-18 volts. Most all vehicles are 12 volt. 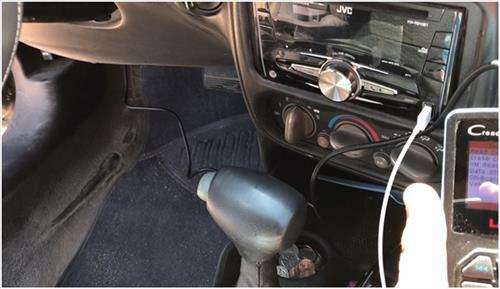 After plugging in the reader to your car, you will then turn the key on, but do not crank the engine. 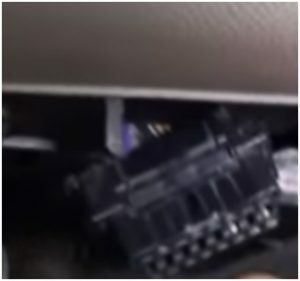 In some applications you may need to look up under the dash to find the port. Scroll to diagnose and press it again. You will see the code reader is processing. Unlike most code readers the processing will be rather quick. 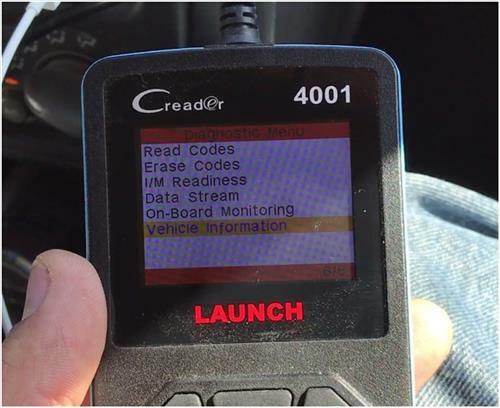 If your vehicle does not throw a code this is what you will see. Your ECU is your computer. It is also sometimes referred to as a engine control unit or ICU or even ECM. But the ICU refers to the actual program in the ECU. And ECM (electronic control module) and ecu (electronic control unit) are also names that are often confused between vehicle owners and the mechanics. This is another great reason to own this tool. Often times just the communication alone between an owner of a vehicle and the mechanic get you off on the wrong foot. 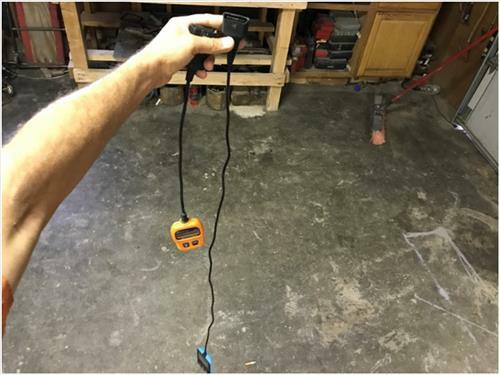 So by owning this tool alone it will save time and money on unnecessary repair. If you see code on the ECU, you will then scroll to the DTC codes and click the green arrow once again. Most any OBDII code reader will give you this code. However most of them will not give you a summary of what this code means. The CReader does. This vehicle shows there is a P0455 code. It also gives a brief sentence of what this code means. No longer will you read the code then go to a chart, or online to get a idea of what it means. In this case most mechanics would know that a P0455 code most commonly is due to a loose gas cap. No back and forth, reading, etc. you are there by the car, and the repair is a matter of min. This is where the average mechanic as well would be excited to own this CReader as I am. After making any repair you must clear the code. Do not assume because you fixed it the code will vanish. In some cases the ECU will reset, but not in all cases. To do this just follows the on screen display. Scroll back up to erase codes. Click on erase codes and follow the directions of turning off then back on the engine. Now you are complete. To be sure that your problem cleared the code. 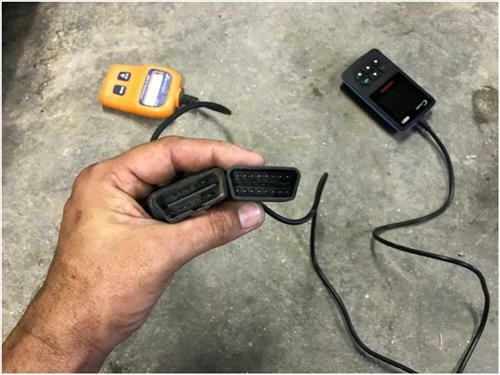 Unplug the code reader and start your vehicle. Let it run a min then shut it off and read the codes again. Another thing I like about the CReader 4001 is the Pin Out. Notice the pic count between the CReader and another code reader I own. The OBDII scanner to the left has locations for more pins, but they are not available on that particular model. There will be some vehicles the other scan tool will not read all the codes. There is 9 pins on that model. The CReader 4001 has a total of 16 pins. It will even read some NPR models. This is a huge plus for any rookie mechanic or master mechanic. The CReader has another feature that is so important to me. 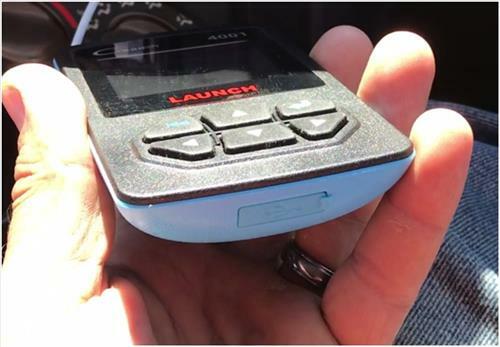 On the go diagnostic. Notice how much longer the chord is. I can sit in the passenger’s seat while someone else drives to read the engine information. This is important because not all problems happen with your vehicle when sitting and running. Driving it and reading the engines temp, rpm etc. is very important to diagnosing some issues. This image is of my RPMs while going down the road. 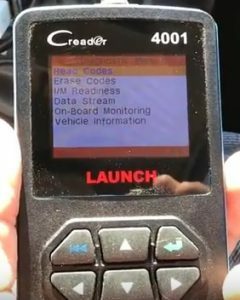 There is much more data streaming that can be done with the CReader 4001. I also enjoy the feature of vehicle info. One simple click and all your vehicles info including the VIN is at your finger tips. 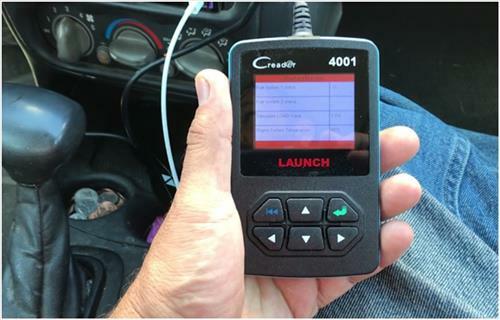 So in closing, if you are looking for a code reader that is easy to use so that you better understands your vehicle, in my opinion for the money, this is the code reader for you. If you are a journeyman mechanic and wish to trouble shoot a vehicle on the fly, such as C.A.N. or freeze frame, DataStream, DTC specifics ,DTC lookups, and my favorite VIN lookup. Then the CReader 4001 is for you as well. thanks for the great review. i didn’t know what a great tool i had bought. i can’t find the manual for this particular model nor can i find updates for it. 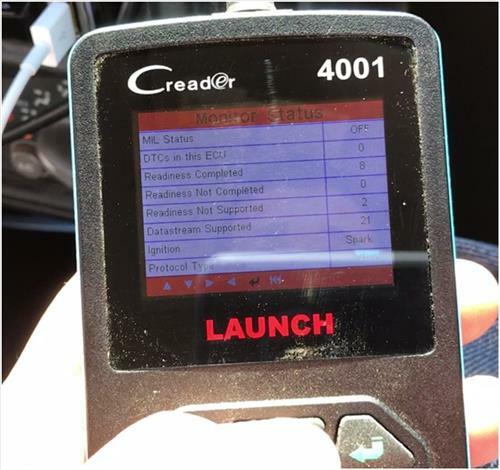 i looked at the crecorder.com and cnlaunch.com and the dbscar.com link above and didn’t see either of those items. let me know if you know. 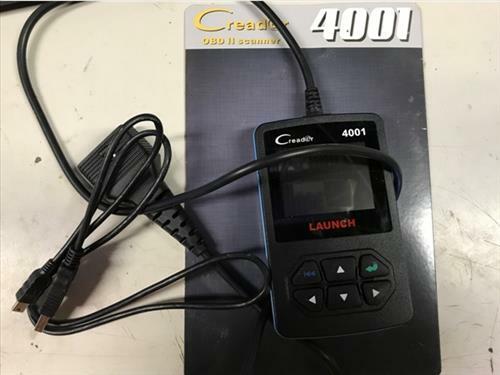 Please provide the website for a website can be used to download a manual for the Creader 4001.